The weather and sunshine don’t seem to be going anywhere, so I’m yet again looking for a cold drink for a treat on the Starbucks menu. I have to admit that I don’t usually go for the Frappuccino style drinks at all, I find them too cold. I mean I either don’t have time for the ice to melt so end up leaving lots, or forcing it and ending up with an ice cream headache. Having said all that these are extraordinary times for a British summer and even I am happy to have a drink that is extra cold. On the menu were the new cheesecake flavour drinks, and I chose the Starbucks Blueberry Cheesecake Crème Frappuccino. 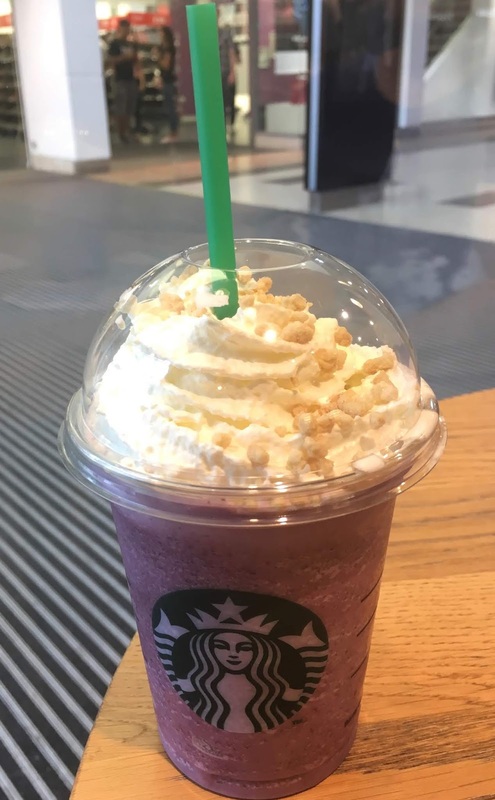 The drink is purple in colour and looks very vibrant, it was also topped with cream, and a biscuit crumble. I started by trying the cream and biscuit crumble together and it was rather delicious, the cream really enhanced the biscuit crumb flavour. You can have the drink as a lighter edition without this topping. The drink itself was creamy and had a not to sweet blueberry taste. The fruitiness was well balanced, and the creamy background flavour made it feel like a blueberry milkshake, or dessert in a glass. Pure yum. With the the weather the way it is currently I have a new found love of Starbucks Frappuccino drinks and will be back to try out the other flavours.